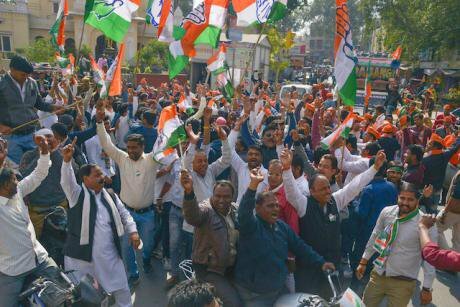 January 23, 2018 - Ajmer, Rajasthan, India - Indian national congress and BJP supporters during campaign on bye-elections. Shaukat Ahmed/Press Association. All rights reserved.Commenting on democracy in Great Britain, a north European journalist attributed its ills to “too much competition”. His own country is accustomed to a much gentler version of the democratic order. Growing mental pollution causes this upsurge in violence. The poison of bigotry being injected into society can be felt and talked about but not measured by an electronic sensor. The seamy side of Indian politics has been highlighted for some time but earlier the main instruments were money and muscle power. The marginalisation of a religious minority and consolidation of the Hindu votes through sectarian incitement are recent developments. Some of the latest polls have proved that polarisation pays. The word “communal” in Indian English is used as a substitute for “sectarian”. What has triggered the current wave of communal violence? In most cases, the spark is provided not by religious fundamentalists but by political activists whose leaders understand the power of religious passion and fault-lines of society. The poison of bigotry being injected into society can be felt and talked about but not measured by an electronic sensor. They call themselves Hindu nationalists. They have become overactive on seeing that votes can be won by polarisation of communities based on religion and castes. The voters, fired by baser emotions, can be driven to the polling booths easily. In a surcharged atmosphere, a gentleman-politician is overwhelmed by a street-smart man who outshouts him. The former species will be extinct one day. The formula for winning elections has been standardised. Create resentment and anger against the political rival. Intensify religious hatred, promote inter-caste rivalry and attack the secularists ruthlessly. Tap the voters’ feelings and promise the moon. Administer the right mixture of fear of the other and hope for the future. That populism and fake nationalism damage the nation is not the concern of the victorious candidate. In such an atmosphere, Indian democracy faces multiple threats, though mercifully none from any rogue General. However, internal subversion by an elected leader is subtle and equally lethal. Democracy can easily be hijacked by an actor-politician, a second-hand car salesman or a seller of snake oil. Anyone with the power to mesmerise the audience. Democracy is turned into a sound-and-light spectacle featuring a 3-D Hologrammed leader. The leader delivers his line with great effect. He knows all about light and camera angle. He chooses carefully the colour and style of his dress for the day’s role. Democracy led in this fashion retains its name but loses its true spirit. Significantly, newspapers publish elections-related news under such telling banners as The Carnival of Democracy. No newspaper in Britain uses this banner. Lovers of democracy lament that every election campaign report uses the word “hawa” (wind) to signify the political atmosphere created, not as a result of the deeds or the misdeeds of the outgoing government, but by the rhetoric used and bogus promises made by the leaders. Then there is another set way of describing the election-eve atmosphere. The word used is “wave”. The biggest democracy turns into a mighty ocean and the candidate who generates a mighty wave by the gift of the gab is swept to power. In India, a community can feel hurt by a word or an image. Politicians can afford to ignore the basic needs of the electorate but dare not ignore the sensitivities of the dominant communities. Offence is given and taken very easily. The book lovers complaining of the writers not writing about “feelings” should know that feelings have been sucked away by politics! If feelings rather than a dispassionate analysis influence the voting behaviour, consolidation of votes through inculcating hatred for and fear of ‘the other’ pays political dividends. In a cut-throat competition for winning political power, no holds are barred. More and more street-smart boys and criminals get into politics which starts losing traditional, dignified public-spirited leaders. Social media makes it easier to create a favourable political atmosphere by rousing baser emotions. The task of poll strategists is merely technical like that of those who generate clouds on a film set and create a dream sequence or a nightmare on screen. The voters get impressed by the performance of the leader descending on the stage or talking to them from remote locations and forget his dismal performance in office. The future of democracy in a virtually real world is another topic. In India, a community can feel hurt by a word or an image. Politicians can afford to ignore the basic needs of the electorate but dare not ignore the sensitivities of the dominant communities. A tough competitor in the political arena knows that feelings are bankable and that defines the poll strategist’s task. He has to incite the mob frenzy that characterises developing countries. V. S. Naipaul has written about it in his books referring to Africa. India is ripe for a fresh visit by Naipaul as he can witness another version of the million mutinies that he observed the last time. As in Africa, so in India. Naipaul will see celebrations by violent mobs. He will be amused by the elected municipal councillors installing their name plates on public facilities and renaming roads. Naipaul will witness a nation in a temper. Long before America voted for Trump, British journalist Gavin Esler went there and discovered the United States of Anger (USA) and wrote a book with that title. Today, an illiterate maid in New Delhi, who has not heard of that book, says that there is krodh (anger) all around. She is worried as to how long the people like her or the daily wage-earners will be able to go out to work in safety. Anyone writing about “intolerance” and the spurt in sectarian hatred and violence has to face “whataboutry” from the Prime Minister’s devotees. What about the riots of such and such year, is their counter question. Yes, India was never free of sectarian violence but there is a qualitative difference between the past and the present. The sporadic incidents in the past were not always politically motivated and, in most cases, the state and the district administration distinguished between the victim and the accused. The civil servants failed at times because of incompetence but did not turn a blind eye knowing that the political leadership would discreetly approve of it. Now an impression has gone around that the ruling party is determined to marginalise a community. The failure to control violence and enforce law and order is one thing but the failure of intent is another. This has encouraged the closet communalists in the bureaucracy, police and even judiciary to be less cautious. The ruling party leaders freely make inflammatory speeches, the like of which would have ended their political career in another democratic country. Till the demolition of the mosque in Ayodhya, one never heard insensitive sectarian statements in the so-called elite or refined or cultural families. That has changed. This is the difference between the past and the present of a secular India. All these years, those trying to harness Hinduism for political benefit faced resistance not just from the liberal secular Hindus but also from the staunch believers who remain committed to their faith’s inherent pluralism and inclusiveness, extending even to the atheists within its fold. This diversity is hated by a rising political force trying to inject the foreign ideology of Fascism into an indigenous faith. It is determined to monopolise power by establishing the primacy of one single Hindu God – Lord Rama. This chosen God comes into the picture in the reports of many incidents of politically inspired inter-religious violence. The condemnation by the liberals no longer frightens the sectarian forces. But what they are up against is a faith tradition having millions of theologically approved Gods. Thus, forcing homogeneity and uniformity on Hindus is going to be a difficult project. This sectarian agenda has no theological basis. It involves no official plan to “reform” Hinduism. If anything, the party activists try to enforce some medieval customs in order to “purify” the faith tempered with modernity over the years. A top item in this agenda that mobilises many believers is reclamation of the temples demolished by the foreign invaders belonging to a different religion. The current political confrontation has been given a religious dimension but essentially it is a political project designed to assert the supremacy of Hindus in a nation that establishes its new identity in the world. Those who have generated this cut-throat political competition are not religious scholars. In fact, they have little understanding of the Vedic literature or of the classical language associated with their faith. The spirit of argumentation that marks this faith tradition is foreign to them. The long-cherished project of the mentor of the ruling party is eventually to establish a powerful Hindu nation. The top leadership of the ruling party is not into politics for pelf or for power for the sake of power or for public service. It has a single-point agenda. The long-cherished project of the mentor of the ruling party is eventually to establish a powerful Hindu nation. Fired by messianic zeal, the party leaders are perennially focused on electoral strategies, ignoring governance and the citizens’ problems. For the first time in the history of independent India, this party has gained unrestricted political power and influence and it does not want to let go of this opportunity. It is keen to move faster towards its goal of establishing what its critics call a “Hindu Pakistan”. The Government has got away with this till now, despite its failure to fulfil Modi’s election-eve promises, because of its power of patronage and the Prime Minister’s charisma. Both are being used by the “cultural” organisation that holds the real power derived from its extensive network of volunteers. But now voices are being heard against the politicians for being obsessed with the Hindu-Muslim debate and ignoring the issues of public health, education, malnutrition, safety and transport. The constant public discourse on the Hindu-Muslim issue and embedded media’s focus on it are bringing democracy into disrepute. Politicians are being ridiculed and condemned more and more. “Plague on both your houses” is a slogan that has been heard. The Prime Minister’s devotees attack anyone criticising their beloved leader. One devotee took to social media to seriously suggest that Modi should impose a dictatorship to teach his critics a lesson! While the ruling party’s Hindutva agenda is mainly responsible for queering the pitch, some other factors also intensify competition in Indian politics. Far too many politicians are full-time politicians. They know no other way of leading a life. Many are into politics for making money. Some lack the qualifications to get any job and possess no skills to earn in any other line of business. So, winning an election at any cost becomes essential for them. Thanks to the declining faith in the police and judiciary and the administration’s failure to provide civic amenities, more and more people are joining politics in order to secure the necessary clout to get the administration to do their work or to secure the safety of their families. They use political power to safeguard the interests of their relations, friends and supporters. They use political power to safeguard the interests of their relations, friends and supporters. More ambitious corrupt politicians use political power to promote the interests of their rich friends in the corporate world. Some business leaders and media moguls do not spend money on sponsoring other politicians and join politics to directly benefit their business. The cut-throat political competition for gaining power exacerbates religious animosities and widens social fault lines. However, it may be argued that such intense competition at least proves that democracy is alive and kicking. The people are willing to kill or die during a heated poll campaign for a leader they love! Here is a dilemma. Suppose the voters turn indifferent and spend the polling day holiday decorating their homes instead of taking the trouble of going to cast their vote. That kind of mass indifference to exercising one’s right will also enfeeble democracy. So, what is the right measure of passion in politics that is good for the health of democracy? There has to be a right balance. It will depend not on the regulatory authorities or election laws but on the wisdom of the leaders and on the proverbial common man.